Patients are often curious about the necessity of dental x-rays during a dental checkup. Dental x-rays help monitor your oral health. Is a dental x-ray important? A radiographic exam of the oral cavity (mouth and teeth) is highly essential in the diagnosis and treatment of oral health conditions. 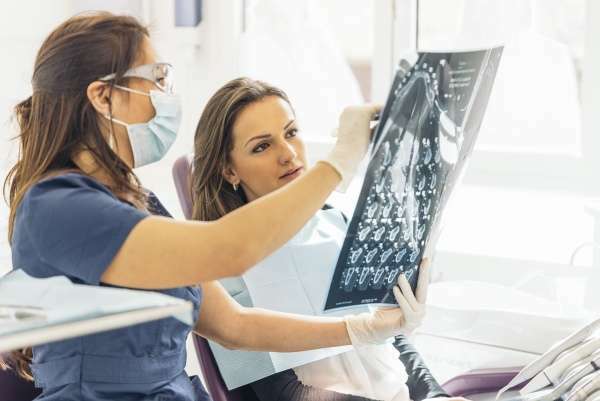 Through x-rays, the dentist will discover issues that may not be immediately visible through physical examinations only, especially before the symptoms become apparent. Radiographs or x-rays take photos of areas of the mouth that the dentist cannot see. The images are possible because the hard tissues such as teeth and bones absorb radiation better than softer gum and cheek tissues, thus producing an image that differentiates these tissues. This means that the dentist can use x-rays to unravel cases of decay, infection, gum disease, bone loss, tooth cracks and other dental issues that are hidden from view. A more significant percentage of tooth decay happens between the teeth that a visual exam cannot detect. X-rays will show anything under a tooth crown, tooth root, jaw and additional mouth structures. If you have an appointment with a new dentist, x-rays will be required to give the new dental expert an overview of your oral cavity. Any subsequent x-ray images will be compared with the original to examine the changes. This means that an x-ray may not be done on every dental appointment unless you are prone to cavities. Children may require more radiographs because their jaws and teeth are still developing, especially if they have had cavities. Missing out on essential x-ray scans may cause serious oral issues for your child. How often should x-rays occur? The dentist will guide you on the frequency depending on the state of your oral health. Some patients tend to be reluctant about x-rays regardless of the dentist’s recommendations, and this may be problematic. Refusing to get an x-ray for a dental issue may result in severe complications in the future that could have been prevented through x-ray scans. Dental x-rays are safe because the level of radiation from x-rays is only about 1/23 of the radiation we face from nature every year. The recent advancements in x-ray technologies have seen a significant reduction in the level of radiation. During pregnancy, you need to inform the dentist before proceeding with the scan. If you have a dental infection during pregnancy, refusing to treat it could spell more danger for your unborn child than the x-ray. The level of radiation may be low, but caution is crucial during the scan to reduce exposure. The radiation from the x-ray device is targeted at your mouth, and you may wear a lead apron to shield other areas of your body. Rest assured, the dentist has the training required to take the scans, and regular inspection of the equipment is necessary. If the dentist suggests getting an x-ray during your appointment, you can be assured it is for beneficial purposes. « What Is Green Dentistry?